I found this vintage silk blouse at Goodwill recently and have been dying to wear it ever since. It's quite a festive color scheme for October, don't you think? When I think of polka dots in art, it's impossible to ignore Op Art, like this 1964 Bridget Riley painting. Bridget Riley was a proponent of the Op Art movement of the 1960s. At one of Riley's solo gallery shows, her paintings were accused of inducing seasickness! Riley with some of her paintings. 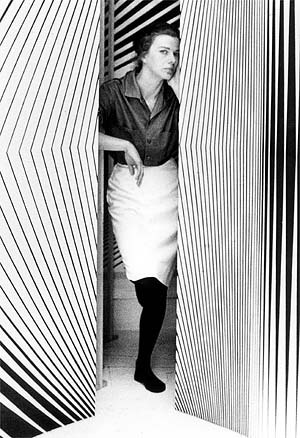 Op Art became mainstream with the 1965 exhibition The Responsive Eye at the MoMA. 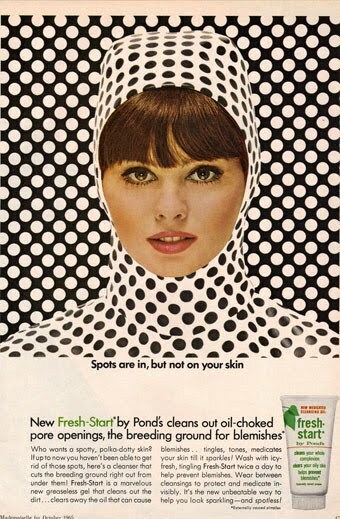 The use of optical illusions in fine art was hastily translated to advertising, as evidenced by this 1965 Pond's advertisement. I love it: "Spots are in, but not on your skin." I'm wearing a vintage silk blouse with an Erin Fetherston skirt, vintage crinoline, Rampage lace socks, and Halston suede boots. oh! wow! love this look!!! Polka dots are so much fun! They look great on you! Awesome work!